The following publication is from the WALT website where they debunk some of questionable marketing of lasers. Click on the link to see the original article. not part of mainstream medicine, in spite of strong scientific evidence. It is now obvious that we can indeed talk to the cells even though we are still rather poor in understanding their language The skepticism about this method has many explanations. In this article, we will focus on one of them – marketing tricks. The collected evidence about the many advantages of laser phototherapy is rapidly increasing. The knowledge about the basic mechanisms as well as about the optimal dosage intervals has improved dramatically in recent years. It should be easy to sell laser equipment to all kinds of therapists just using the available scientific knowledge – which is truly amazing in and of itself. But this is not always the case. Too many manufacturers deliver poor equipment and training, and too many of them use sales gimmicks in order to make their equipment look unique. It is not that the devices they’re selling are incapable of producing therapeutic effects. They are; even a $10 lecture pointer has some therapeutic potential. It is that they are simply NOT capable of delivering upon many (in some cases, most) of the claims that are made about them, whether those claims be about the range of treatable indications, therapeutic outcomes, depth of penetration, speed of treatment, method of application, or patented waveforms, etc.. Such sales techniques and outright dishonesty are confusing for consumers and risk draining the therapy of the credibility it deserves. Let us look at some examples! One laser manufacturer in the USA claims that their lasers produce “soliton waves” by “piggy-backing one wavelength upon another”, and that these “penetrate deeper into the body than is possible with any other type of laser”. This sounds impressive and unique, but it is a sales trick, no more, no less. No therapeutic laser on the market produces solitons. And, even if it were possible and financially viable to do so, what evidence is there to support this manufacturer’s claims of therapeutic benefit? The husband-and-wife “inventors” of the Scalar Wave Laser claim to have developed the “most advanced low level laser technology with state of the art quantum scalar waves” that supposedly employs a “unique approach to accessing the quantum neutral unified field state” to “dissolve cellular memory, normalize body systems, optimize anti-aging capabilities, and activate the glands and higher dimensional subtle body that yogis and mystics have tapped into throughout the ages”. This is, of course, a complete fabrication, a crackpot theory. No laser equipment designed for laser phototherapy is producing scalar waves and again, even if such waves existed, there is no evidence whatsoever that they should have a positive or negative effect of cell functions. For many indications, some degree of light penetration through tissue is an advantage. The penetration of laser light into different types of tissue is surprisingly poorly investigated, but enough is certainly known to refute the claims of some manufacturers. There are two extremes oft found in the marketing claims, one that photons can penetrate clothes and even the entire body at very low powers, the other that very high power output is needed to reach very deep-lying targets. Both claims are characterized by gross exaggeration, demonstrating either complete ignorance or deliberate misapplication of the science of optics. Representatives of this company also claim that these photons go right through our bodies. Whilst it is possible for very high-energy particles such as neutrinos and for x-rays, being very different waves, to penetrate through our bodies, the low energy photons produced by therapeutic lasers are physically incapable of penetrating through that much tissue. Recent research is hinting that low power and long exposure is better than high power and short time for tissue regeneration, and, seemingly underlining this statement, this same company has presented research papers showing success using their lasers in the clinical setting (without clothes). Serious users of this approach report treatment times in excess of 15-20 minutes, which may produce a systemic effect by irradiating blood through superficial blood vessels. Well enough, but this does not involve photons penetrating the body, and certainly will not work through clothes. Mixing science with pseudoscience is pseudoscience. The international system of laser classification is concerned only with the risk for eye injury and, at higher powers, skin damage. It has nothing at all to do with suitability for laser treatment, nor does it mean a generational change nor ensure any improvement in efficacy. Many different parameters are considered in eye risk evaluation (laser wavelength, beam diameter, beam divergence, exposure time, pulsing vs continuous emission, type of pulsing and more). Actually there are Class I lasers that are higher powered than many Class IV instruments! 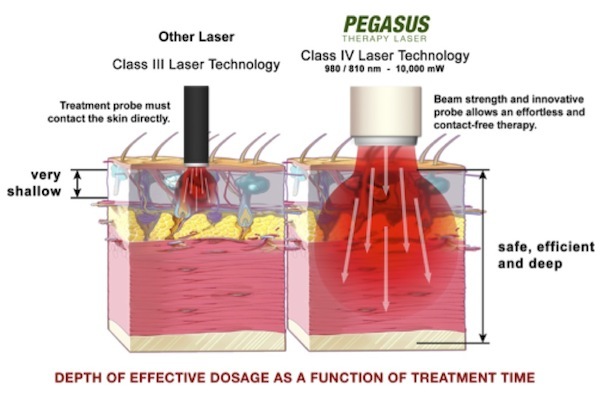 So, there is no sense in or reason for, other than deception, the term “Class IV laser therapy”. For example, some manufacturers claim that their Class IV lasers (e.g. 10-60 W, 980 nm laser) offer superb penetration through tissue (from 6-to-9 inches according to one manufacturer), and that the so-called “weak” class IIIB lasers (e.g. 500 mW, 808 nm laser) hardly penetrate the surface skin barrier at all. However, in the chosen example below, the very opposite is the truth! Due primarily to its absorption by water in the tissue, 980 nm penetrates less than 808 nm, and this is not compensated by the higher power. At around 808 nm we actually have the best penetration into tissue, and increasing power only increases the depth of penetration marginally. With the higher superficial absorbance of the 980 nm laser there will be considerable heating, and, while heat is fine for many conditions, it is not of what photomedicine is constituted. The picture to the left supposedly illustrates the superiority of a Class IV laser. Although the illustrations and explanations vary, there is more than one laser company using the same flawed argument to promote high-powered lasers. It is also interesting to note the use of the term “Class IV technology”. There is no specific “technology” that enables a manufacturer to choose a laser emitter that produces more than 500 mW, thus the term “Class IV technology” is simply used to infer a differential benefit that does not exist. Apart from power, the only differences between Class IIIB and IV lasers are the potential hazards and, usually, the price. For more detailed information about the penetration of laser light, we recommend that you read our article “Penetration of light” in Laser World (www.laser.nu). The power of therapeutic lasers in use. Both studies are from Brazil and the outcome is alarming, although don't think that this is a problem only in Brazil! Certainly, many laser manufacturers are responsible and are producing equipment of a high standard. But too many are not! Read the abstracts below, and take heed! Photomed Laser Surg. 2009;27(4):633-639. Radiant power determination of low-level laser therapy equipment and characterization of its clinical use procedures. The main objectives of this study were to characterize low-level laser therapy (LLLT) and the physical therapy clinical procedures for its use. There are few scientific studies that characterize the calibration of LLLT equipment. Forty lasers at 36 physical therapy clinics were selected. The equipment was characterized through data collected from the owner manuals, direct consultation with the manufacturers, and a questionnaire answered by the users. A digital potency analyzer was used to calibrate released mean potency. Qualitative data were presented throughout the descriptive statistics and quantitative data were analyzedby the Wilcoxon/Kruskal-Wallis and Fisher tests (significance, p < 0.05). claimed by the manufacturer (p < 0.05). In 30 cases, the analyzed equipment presented a potency between 3 microW and 5.6 mW; in three cases, the potency was >25 mW; and in seven cases, potency was nonexistent. CONCLUSION: The analyzed equipment was out-dated and periodical maintenance was not conducted, which was reflected in the low irradiated potency. Despite the increase in the use of low-level laser therapy (LLLT), there is still a lack of consensus in the literature regarding how often the equipment must be calibrated. For the evaluation, a LaserCheck power meter designed to calibrate continuous equipment was used. The power meter was programmed with data related to the laser's wavelength to gauge the real average power being emitted. The LLLT devices were evaluated in two ways: first with the device cooled down and then with the device warmed up for 10 minutes. For each condition, three tests were performed. The laser probe was aligned with the power meter, which provided the real average power being emitted by the LLLT device. All of the data and information related to the laser application were collected with the use of a questionnaire filled in by the supervising therapists. RESULTS: The 60 devices evaluated showed deficit in real average power in the cooled-down and warmed-up condition. The statistical analysis (ANOVA) showed a significant decrease (p<0.05) in the real average power measured in relation to the manufacturer's average power. On average, the most common dose in the clinics was 4 J/cm², and the most desired effects were healing and anti-inflammatory effects. According to the World Association for Laser Therapy (WALT), 1 to 4 J of final energy are necessary to achieve these effects, however only one device was able to reach the recommended therapeutic window. CONCLUSION: The LLLT devices showed a deficit in real average power that emphasized a lack of order in the application of this tool. The present study also showed the need for periodical calibration of LLLT equipment and a better technical knowledge of the therapists involved. There are principally two types of pulsing in laser phototherapy – chopped (switched) or super pulsed. A chopped beam is a continuous beam that is electronically (or mechanically) switched between on and off. During the moments when it is on it has typically the same output power as in continuous mode, but as it is not on all the time, the average output power is less than when it is continuous. The average power is a function of the continuous wave power and the duty cycle (the ratio of the “on” time of the beam to the total emission (“on” + “off”) time, usually expressed as a percentage). Typical laser types are most of the gas lasers (such as the HeNe laser) and all semiconductor (diode) lasers (except the GaAs laser). the GaAs laser produces its maximum emission at 904 nm. Restating the above, even though the peak power of the super-pulsed GaAs laser may be very high, it lasts for an extremely short time compared to the pulse cycle, resulting in an average output power that is usually a thousand times lower than the peak power. For clinical use, it is the average Power that counts. The energy (dose) delivered from pulsed lasers is always the average output power multiplied by the exposure time. The average power is the important output of the laser. Some manufacturers preferto label these lasers as “very strong” and state only the peak power which then can be in the order of 100 watts. This sounds impressive, but typically these lasers emit 10-100 mW average power, and this is what counts for the treatment. The GaAs lasers are quite useful in physiotherapy, but care has to be taken. In some super-pulsed lasers the average output changes with the set pulse frequency, so that low pulse repetition rates deliver very low average outputs. This means that with such lasers, with low frequency settings, the treatment time may be impractically long in order to deliver a reasonable dose. One manufacturer, for example, promotes its super-pulsed lasers as having 25,000 mW or 50,000 mW of power, and offers the user a small number of preset ‘programs’ which, essentially, only adjust the pulse frequency and, therefore, the average output power. One of these ‘programs’ sets a frequency of 5 Hz. To calculate the average power one must only know the Peak Power, the Pulse Frequency and the Pulse Duration. As mentioned previously, the pulse duration (i.e., the ‘width’ of each pulse of energy) of most GaAs devices is 100-200 nanoseconds (0.0000001 – 0.0000002 sec). If we use the manufacturer’s ‘highest’ power option (50,000 mW), select their 5 Hz program, and assume the longest possible pulse duration (0.0000002 sec) for our calculation, we arrive at an Average Output Power of only 0.050 mW, or fifty millionths of one Watt. With this very low average power it will take twenty thousand seconds (5.6 hours) for this manufacturer’s laser to deliver one Joule. Impractically long, perhaps? Other super-pulsed lasers employ “pulse trains”, which enable the average output to be maintained at a constant level over all frequencies. The importance of checking upon this is obvious when it comes to acquiring a GaAs laser. One manufacturer claims that its dual-wavelength (800 nm and 970 nm) high-powered Class IV laser has better penetration due touts ‘Intense Super Pulse’ emission. However, these diode lasers are not super pulsed, they are “chopped”, and chopping does not offer increased penetration. In this case chopping the output simply reduces the tissue-heating effect of the high power laser by both reducing the average power and also allowing time for the tissue to thermally relax (i.e., dissipate heat) between each pulse of light. The biological differences between super-pulsed and chopped emissions are likely to be fundamental. Is pulsing then of interest? The in vitro studies by e.g. Tiina Karu clearly show that the type of pulsing is of importance. However, in these situations one type of cell and one type of reaction is studied. In the clinical situation, many types of cells are irradiated and a multitude of events happen. So is pulsing then of any clinical importance? The answer is that we do not know. Hz to 146 Hz) are even presented at a higher “harmonic” so as to achieve a higher average output power, further increasing the disparity between their original intended application and their current use. Despite this, and the fact that there have been no studies undertaken to compare or confirm the efficacy of the original or higher-harmonic laser-delivered frequencies in humans or animals, these and other frequencies are provided as an integral part of many different therapeutic laser devices and their pre-programmed protocols. experience improves. Others, however, provide the user with nothing more than a choice of letters or numbers that represent different “proprietary programs”, ensuring that the user is kept completely in the dark as to what they’re actually doing. Such programs may consist of various frequencies and exposure times, often in automatically-changing combinations of such; for instance, 20 seconds of 500 Hz + 40 second of 120 Hz + 10 second of 1500 Hz. The user is informed only that that “program” is supposed to be the best for e.g. headache, and that another program and time/frequency combination is the best for arthritis, etc. The buyer of such an instrument trusts that the constructor of the instrument knows that this is a fact. However, there are no such optimal time/frequency combinations scientifically proved to be better than others. Also - how can a setting for “arthritis”, for example, be the same for a finger joint as well as for a knee? Who can verify the pulse repetition rates recommended? Such preset protocols will generate nothing more than vaguely satisfactory outcomes, at best; neither what your patients expect of you, nor what you should expect of a clinical tool that has, most likely, cost you thousands of dollars. One particular manufacturer has corrupted the use of the terms ‘Optical Window’ and ‘Therapeutic Window’, well-known to many within the phototherapy field, to label their preset programs as so-called ‘Therapeutic Optical Windows’ that, supposedly, deliver optimal combinations of the many different parameters that influence clinical outcomes. As an exercise, let’s consider the various device and treatment parameters and patient characteristics that affect variations in phototherapy outcomes, and determine how many iterations of these must be clinically tested and validated before one could claim, with even a hint of honesty, to have determined the optimal “Therapeutic Optical Windows” for even a handful of indications. We recommend, instead, availing yourself of high-quality research published peer-reviewed journals, informative manuals and qualified seminars, rather than automatic settings. Use palpation, your own physiologic knowledge, your patients’ feedback and your experience to guide you in your choice of parameters. There are two extremes on the market – those promoting very low power output and those promoting very high power output. Which is best? Conclusion: very high powered lasers are useful for treating large areas in short time and to obtain pain inhibition, but seemingly less effective for basic cell stimulation. And they do not penetrate much deeper due to the high output– in fact, the very act of making a high power laser ‘safe’ for long-duration exposures may make it less capable of penetrating as deeply as a lower-powered laser that can e.g. be applied in contact and with slight pressure to the skin. All types of medical lasers are useful within their own limitations, but the very high powered lasers are still lacking scientific documentation in spite of their increasing popularity with salesmen and their less-informed customers. some distance from each other, each having an output of 450 mW, i.e. class III. This instrument is then a less-hazardous (by definition) class III instrument with an output of 4.5 W (4,500 mW). or to add such, is not that LEDs are better or more efficient, but simply that they are cheaper to buy and to drive electrically. Although LED instruments can also elicit good clinical results, they are not lasers and it is technically and ethically incorrect to call them such; doing so serves only to benefit the manufacturer and/or marketer of the device, not the purchaser. If you are in the process of buying a laser instrument without experience of the market, you are vulnerable to the sweet arguments of the salesmen. One aspect is the price. Is high price indicating high quality and good treatment results? No. Not necessarily the opposite either. We can recommend that you acquire a power meter (separate or built-in). Also find out the service level of the company – what happens when it breaks? Laser phototherapy is a wonderful tool in medicine and useful for just about any medical practitioner. The scientific evidence is considerable but differs from one indication to the other. What is already known is sufficient for piquing the interest of anyone with an open mind. So why use sales tricks when the plain truth is good enough? This article from Jan Tuner talks about LiteCure's horrible marketing, how 980nm is really bad and how Class 4 lasers are too powerful and often misused. They recommend 905nm for deep penetration. The US laser manufacturer LiteCure (a.k.a. Companion/Pegasus for veterinary version) belongs to a group of laser manufacturers that confuse customers and let consumers pay a high price for something that they do not need. LaserAnnals has previously addressed the so-called Class IV lasers for LPT in general and in a few cases mentioned this particular culprit LiteCure. In this article, we will make a closer check on the credibility and ethics of this company. Anyone with some basic knowledge about tissue optics knows that 980 nm has a poor penetration due to absorption by water and lipids, and that 808 nm (the illustration actually states 880 nm, but this is not a commonly-used laser wavelength so we assume this was another error…) actually is in an optical window where penetration through skin is optimal. Using very high power with 980 nm doesn’t increase penetration considerably, but instead causes more light to be absorbed superficially more quickly, leading to heat generation. And LPT is not based upon heat but upon stimulation! Although a step in the right direction, even this illustration is still misleading and, basically, incorrect: The effective depth of laser irradiation does not increase over time. Further to that, the “effortless” non-contact technique causes considerable energy loss by reflection and backscatter – together, remittance, which has been measured at upwards of 80% from bare skin (Al Watban, 1996) – and up to 100% energy loss due to absorption within animal hair/fur. This is hardly “efficient”! The truth is the opposite to what their sales claims try to tell: A 0.5 W 808-810 nm Class 3B laser actually has a superior ability to penetrate into the body, whereas a 10.0 W 980 nm Class 4 has limited ability and also causes more problems with regards to heat generation. And, as the lower-powered Class 3B device may be applied in contact with the skin directly over the pathological tissue, and held steady for the necessary time to deliver the appropriate amount of energy, it is also significantly more efficient, accurate and safe. The problem is that their consumer group is rather ignorant about LPT basics and swallow the bait. Fortunately for LiteCure, very high energies are bio-inhibitory and have a temporary pain relieving effect. This is an impressing effect when demonstrated. The downside of the procedure is that the needed reduction of an inflammatory process in inhibited and so is the body’s ability to regenerate itself. This is what is called “a sales trick”. This is similar to the way the devil reads the bible. The above conclusion follows a part of our book where the remarkably low powered lasers on the Canadian market in the ‘90s is discussed. The vast majority of the lasers used were HeNe 1-2 mW and GaAlAs 5-30 mW. So the 400 mW lasers that had just arrived on the market at that time seemed to have a new potential – and they had. Continued reading of our book reveals that high energies probably will have a better effect on pain conditions but probably not on superficial conditions such as wound healing. In fact, the discussion following the text about “high power” strongly modulates their usefulness. This text appeared initially in the 2002 book “Low level laser therapy – clinical practice and scientific background”. In following versions of this book, the text has been modified and becomes more critical of extreme energies. And believe me, the next one will be even more critical, to avoid any misunderstandings. An appropriately configured and applied Class 3B device can do all that we need, and if you want to reach deep targets the 904 nm superpulsed GaAs is the best tool! Panton L, Simonavice E, Williams K, Mojock C, Kim JS, Kingsley JD, McMillan V, Mathis R. Effects of Class IV laser therapy on fibromyalgia impact and function in women with fibromyalgia. J Altern Complement Med. 2013 May;19(5):445-52. FM is a devastating condition and LPT is probably a viable option to use, especially since other therapies are rather ineffective and life-long intake of painkillers not a viable option, with the side effects in mind. The study by Panton is obviously performed by a competent team of medical experts, but it seems they have “been taken for a ride” by the LiteCure company. The overall effect of the laser treatment was modest, but had some effects. For the laser group, treatment was rendered utilizing a LCT-1000 (LiteCure LLC, Newark, DE) solid-state GaAlAs laser delivering a continuous-wave, dual-wavelength laser with 20% 810 nm, and 80% 980nm at 10 W. Each 56.45 cm2 treatment point was treated with laser at 10.63 J/cm2 and warm air utilizing a grid scanning technique to avoid overheating tissue. Participants were instructed to expect some warmth but that the treatment should not burn and to provide verbal cues if the treatment spots became excessively warm. Each treatment point was treated for exactly 60 seconds for a total of 600 J per point, for a total daily treatment dose of 4200 J. The dual wavelength was used for two reasons: (1) this is what is commercially available and (2) two wavelengths allow for treatment in patients with different skin colours since different melanin concentrations will absorb light differently. Both wavelengths are in the accepted therapeutic window. The sham treatment consisted of 60 seconds of warm air alone over the seven tender points. a. The cause of FM is not known, but it is manifested by painful bodily points. If pain were a separate biological unit, smashing it with a sledge hammer might be useful. But there is probably more to it, like peripheral neural sensitisation and inflammation. 600 J (!) is given to each point and this is a very high and quite inhibitive energy. And a “point” is declared to be 56.45 cm2. This is rather an area. But by spreading out the light over a large area, the dose becomes 10.63 J/cm2. Such a dose appears to be reasonable, but the energy is not. b. The paper says: Like the IIIB lasers, recently developed Class IV therapeutic lasers use diffuse light at wavelengths in a therapeutic window that allow penetration of the light deep into the tissue. True, but these lasers do not penetrate deeper than the Class IIIB/3B lasers, so this is a deliberately misleading statement. 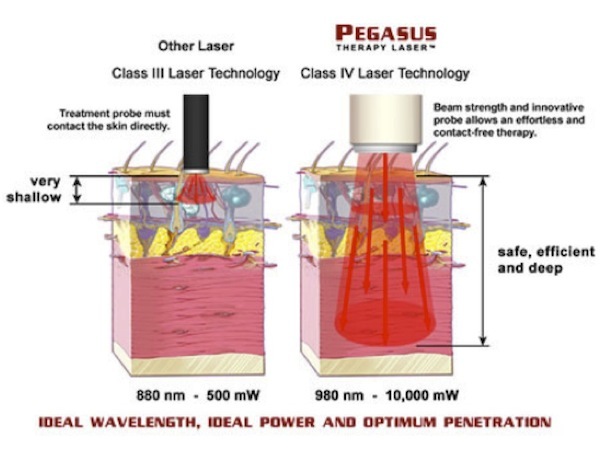 Further, Class IV/4 therapeutic lasers are not exactly “recently developed”: The defocused beams of Class IV/4 surgical lasers have been used for therapy for equally as long as Class IIIB/3B devices. And the first commercially-available dedicated Class IV/4 therapeutic lasers came on the market in Europe during the ‘90s – which, of course, contradicts the claims by LiteCure and others that Class IV/4 laser therapy is new improvement of Class IIIB/3B. As they are now, these earlier Class IV/4 therapeutic lasers were very expensive and inefficient, and proved no more effective than the already-available lower-powered lasers, so their use did not flourish until the marketing machine took hold in the USA. c. The paper says: This development has led to the use of Class IV lasers to treat a variety of conditions including skin lesions(24,25), acute soft-tissue injuries (26), and chronic pain syndromes (27) such as FM. In fact, the references 24-27 are not related to the use of “Class IV” LPT lasers at all! This is a technique used often by LiteCure and other marketers of high-powered Class IV therapeutic lasers, banking on the fact that the casual reader will not follow through and actually read the referenced studies. d. The paper says: There are only a few studies that have used laser therapy to treat pain (16,17,27,37,38). What about 125 published RCTs? If changed to “FM pain”, this is a more valid statement. And one of the most frequently quoted papers on FM and LPT (Gür et al.) used 2 J per point and with better results. e. The paper says: Studies suggest that Class IV lasers have a beneficial analgesic and anti-inflammatory effect in humans (47-50). No, they don’t! All four papers to which they’ve referred are on Class 3B! f. Previous studies on FM and LPT have been using considerably lower energies, so the reason for increasing these by a factor 100 seems to have but one background: To prove the superiority of the manufacturer’s product. However, the clinical outcome of this paper was not better than those where is Class 3B lasers have been used. And let’s address another niggling falsehood: There is no such thing as “Class IV technology”!! 499 mW is Class 3B, 501 mW is Class IV. This is no “technology”. Laser classification is simply related to the relative risk posed by the power, wavelength and distribution of the laser emission! The manufacturers of the Class IV lasers used in LPT have sponsored a small number of clinical studies. They all contain considerable flaws and even lies and are far from convincing. But they do contribute to the general confusion and are an obstacle in the general acceptance of laser phototherapy. As mentioned previously, a typical trick of the Class IV vendor is to make reference to Class 3B papers, with proper documentation of their own products lacking. This was the old trick of LED vendors in the ’90s. The LEDs have, in the meantime, created their own scientific groundwork and do not have to use sales tricks any longer. The power output of therapeutic lasers has increased radically during the nineties. McKibbin reports that there were about 1800 therapeutic laser units in Canada in 1990. 22% of them were HeNe lasers with an output of 1 mW or less, 35% HeNe lasers with 1-2 mW, 13% 830 nm units with an output up to 5 mW, 3% 830 nm units with an output up to 30 mW, 26% GaAs units with an output of 5 mW or less, and 1% units in the 760-780 range nm with an output up to 30 mW. Now in 2009, the situation is quite different. HeNe units are being replaced by stronger InGaAlP lasers up to 500 mW, GaAlAs units of 7 000 mW are on the market, and GaAs units of 100 mW and more are available. Even though it is possible to attain some effects with a 1-2 mW laser, there is no doubt that with a laser 100 times stronger, it is much easier to achieve biostimulating effects, at least if one intends to use treatment periods of the same length. Power density is also very important! The authors used to have certain misgivings about an “inflation” with respect to the output power of therapeutic lasers. One misgiving was, and still is, the obvious risk of eye damage. The need for protective glasses has previously been exaggerated, but is now becoming more important. Another misgiving is the lack of research in the field of “high-power” therapeutic lasers. So far, insufficient data have been published on these powerful lasers. For the moment, we must rely primarily on our own clinical experience. That experience, however, is so encouraging that it cannot be ignored, even with the lack of scientific support. It would appear that “high-powered” therapeutic lasers will be able to further expand the scope of laser therapy, especially in pain therapy. The doses previously recommended for laser therapy still hold true, in a way. However, much of what we know about dosage is based upon wound healing studies. This is the field in which both stimulating and inhibiting doses have generally been observed. But a wound is superficial, and the superficial tissue will absorb most of the laser energy. So treating a condition in the inner ear through the bone behind the ear is quite a different matter. The dense bone behind the ear absorbs some 90% of the light energy. Skin and blood absorb another 5%. Thus, 100 J in contact mode means only some 5 J or less in the inner ear. For pain and inflammation in large joints, such as the knee, quite a few joules may be required on the surface before the actual target receives the energy needed. Using the same amount of energy but with different energy densities will not necessarily trigger the same biological response. Kim  used 1.2 J in plastic and aesthetic surgery. The energy was delivered either by a 1000 mW or a 60 mW 830 nm laser (1000 mW × 1.2 sec or 60 mW × 200 sec). Both were effective, but the 60 mW laser was more effective in the initial period of wound healing, while the 1000 mW laser was more effective in the late period. Are strong lasers better than weaker ones? YES and NO. Output power should not be too low for its purpose. If the power is too low, it causes unnecessarily long treatment time in order to achieve the required total dose (see more about the dose in the next chapter). Also, if output power is too low, it could result in the power density being too low which is an important parameter in treatment. Nor should output power be too high for its purpose. If the power is too high, the light could burn tanned, coloured skin, tattoos or skin with dark hair. Furthermore, in most countries, there is a power limit of 500 mW (= 0.5 watt), above which the laser may be a Class 4 laser. If so, it usually means that it requires oversight by an MD or DDS, more safety measures, and significantly more regulatory control. Also, if the power is too high, it can result in unintentionally high doses which can give less good treatment results than necessary (see the Arndt-Schulz curve in the next chapter). And finally, time is also an important treatment parameter. Administering a certain number of joules over a certain area using a certain laser power during a certain time, may not give the same result as using a ten times stronger laser during one tenth of the time with unchanged optical configuration. Another way to say this is that the rule of reciprocity is not valid. Some laser companies claim that a Class 4 laser ‘by default’ is better than a Class 3B laser (4 is higher than 3, so it has to be better… right?). This is simply not true. The classification of lasers is a measure of eye hazard, nothing else. While defocused Class 4 lasers may well be used successfully in laser therapy, this does not have anything to do with the laser classification.